If you have any questions about the DIAMOND FOR EVER information page below please contact us. The sailing yacht DIAMOND FOR EVER is a 36 metre 119 (foot) well sized aluminium ship which was crafted at Royal Huisman and devised by Ron Holland Design and Banneberg Designs Ltd. A good sized sloop motor sailer DIAMOND FOR EVER is a very distinctive Dutch built superyacht which was launched to accolade in 1987. 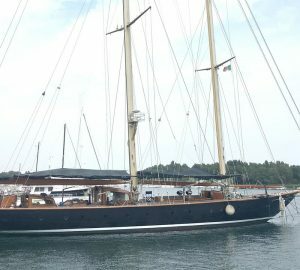 Accommodating 6 guests and 5 crew members, sailing yacht DIAMOND FOR EVER used to be called Acharne which was her project name and/or actual name. 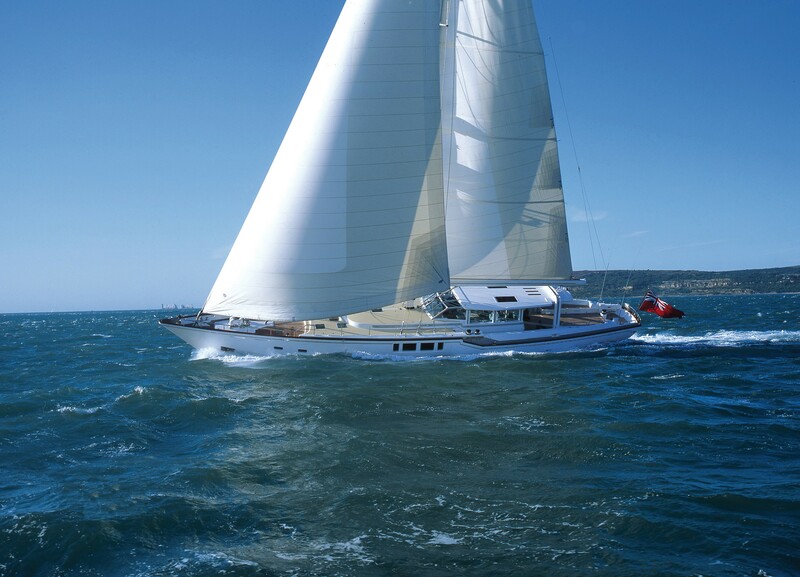 The yacht is a traditional sloop motor sailer. Launched to celebration in 1987 this boat’s interior design and decor showcases the traditional interpretations which are originating from Bannenberg Designs Ltd/Pieter Beeldsnijder and the owner who commissioned the yacht. Ron Holland Design was the naval architecture company involved in the technical vessel design work for DIAMOND FOR EVER. 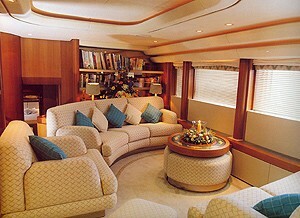 Her interior design was conceived by Bannenberg Designs Ltd/Pieter Beeldsnijder. Ron Holland Design and Banneberg Designs Ltd is also associated with the yacht wider design collaboration for this boat. In 1987 she was actually launched with accolade in Vollenhove and post sea trials and final completion was then handed over to the new owner. Royal Huisman completed their new build sailing yacht in the Netherlands. The hull was crafted from aluminium. The sailing yacht superstructure component is fabricated mostly from aluminium. With a width of 7.41 metres / 24.3 ft DIAMOND FOR EVER has moderate internal space. She has a 6.43 (21.1 ft) draught of 6.43m (21.1ft). She had refit improvement and modification undertaken by 1996. 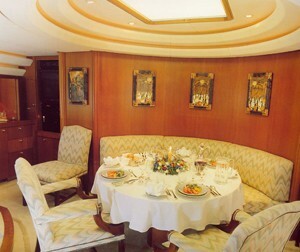 Installed with twin MERCEDES diesel engines, DIAMOND FOR EVER will reach a top speed of 12 knots. Connected to her Mercedes engine(s) are twin screw propellers. Her total HP is 460 HP and her total Kilowatts are 478. Regarding thrusters she uses Richfield. 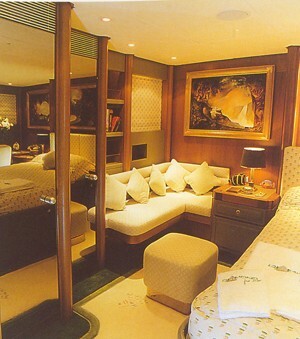 The good sized luxury yacht sailing yacht DIAMOND FOR EVER can sleep as many as 6 passengers and 5 crew. 36.24 metres / 118.9 feet. Aqua Air X2 is the company that made the air con . She has a teak deck. The luxury yacht DIAMOND FOR EVER displayed on this page is merely informational and she is not necessarily available for yacht charter or for sale, nor is she represented or marketed in anyway by CharterWorld. This web page and the superyacht information contained herein is not contractual. All yacht specifications and informations are displayed in good faith but CharterWorld does not warrant or assume any legal liability or responsibility for the current accuracy, completeness, validity, or usefulness of any superyacht information and/or images displayed. All boat information is subject to change without prior notice and may not be current.